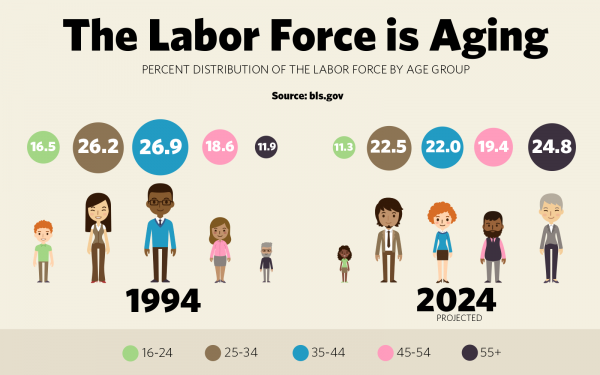 Employees in America today are more age diverse than ever before. 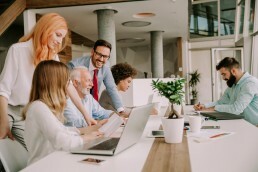 Many older generations, including baby boomers and traditionalists, are staying in the workforce past the typical age of retirement. Meanwhile, the 61 million members of Gen Z are preparing to look for employment in the coming years, and, by 2025, millennials will make up the majority of the workforce. Planning spaces that accommodate the needs of a diverse group of employees can be challenging, which is why we created this guide detailing what each generation needs from their workspace. 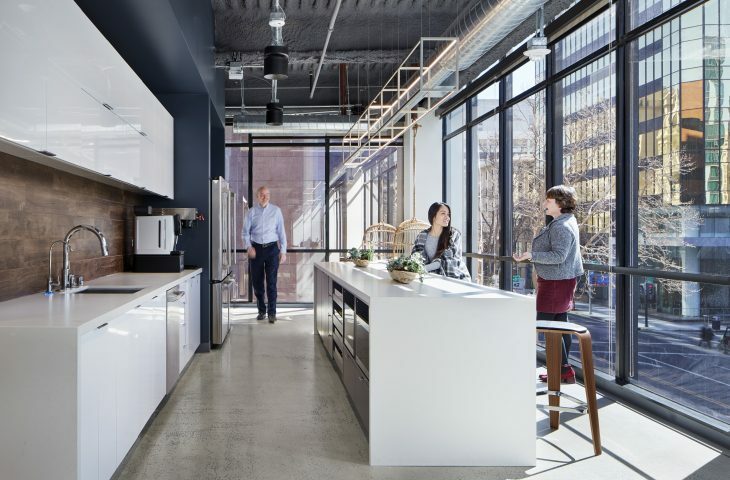 Here are the five generations of employees in the workforce today and how you can design spaces to meet their needs and wants. Although the youngest members of this generation turn 76 this year, a few members are still in the workforce. None of them grew up with technology, or worked with it for most of their careers, so accommodations may be needed to help them adapt. Many of them remain in senior positions in law, accounting, healthcare, and architecture and engineering, and some have taken administrative roles to keep busy after retirement. Although this generation may not be working for much longer, their experience growing up after the great depression and World Wars has made them a loyal, hardworking asset. By making changes at the office to meet their needs as they age, they’ll return the favor by staying loyal to your organization. Members of this generation are usually defined as goal-oriented and independent, qualities that have propelled them into upper management positions. They tend to thrive on familiarity and routine, meaning that the changes caused by an office redesign could be disruptive for them. They grew up in an era when everyone got their own private office (or, at the very least, a private cubicle), but usually enjoy collaborative workspaces. This generation is a mix of folks who are comfortable with technology and folks who are not— they didn’t grow up with it like many millennials did, but they have also had time in the workforce to adapt and learn. They value the opportunity to work independently (in fact, 41% describe themselves as entrepreneurs) but also appreciate the opportunity to collaborate with generations above and below them. Creating spaces like communal kitchens is a good way to draw them out and allow them to socialize on their own terms. Generations X also appreciates the work-life balance lifestyle so consider offering telecommuting options for this group. 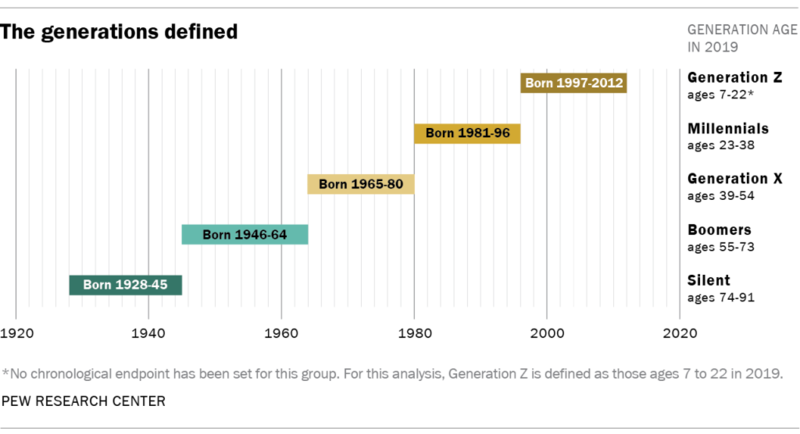 Generation Y is the first generation of “digital natives,” where most members of this generation grew up with a personal computer in their home. As a result, they embrace the use of new technology in the workplace, including features that allow them to work from anywhere like power adapters and wifi in outdoor spaces. They expect a modern workplace, and are eco-conscious and appreciate biophilic design and sustainable features in the workplace, including opportunities to recycle and compost. For many designers, Generation Z (or post-millennials) is the most unknowable generation. According to the US Labor Department, they are expected to make up at least 25% of the US workforce by 2020. The youngest members are still relatively new to the workforce, and we’re watching as they demonstrate an increased need for work-life balance and workplace wellness. Incorporate elements like in-house gyms or rock climbing areas so they have options for physical activity throughout the day, and consider integrating objects like sit-stand desks and ergonomic furniture to show you care about this generation’s need to stay well while at work. Furthermore, members of this generation don’t remember a time before the internet — they’re true digital natives, and feel most at home in a workspace with ample technology. They want to collaborate face-to-face as well as online, so consider using team communication software like Slack or Microsoft Teams. In addition to wanting virtual workspaces, they also desire opportunities to work more independently and tend to shy away from open office concepts. Help them feel more at home by providing break out rooms and spaces for quiet reflection. We know how tricky it can be to accommodate the needs of a multigenerational workforce in a single, cohesive space. In our next post, we’ll share a few practical solutions you can use to create workspaces that are welcoming to employees of all ageWhat design changes have you made to meet the needs of several generations of workers at your organization? We’d love to hear your thoughts in the comments. As we kick off 2019 by partnering with clients new and old, we’re excited to pause and consider what design trends will shape our workplace in the coming year. 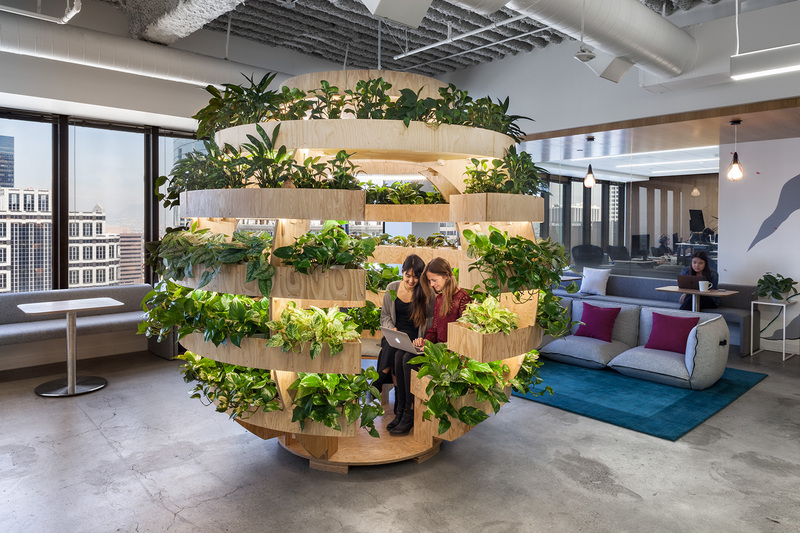 In 2018, we saw more companies focusing on designing for wellness and creating flexible workspaces where employees can seek solitude or work collaboratively. Here are six workplace trends our team thinks facilities managers and real estate professionals will be focusing on in 2019. Since open offices are here to stay, we predict flexible workspaces that allow both focused, independent work and group projects to become even more of a priority. More importantly, it’s what employees want: 53% of employees surveyed in mid-2018 value working in different spaces throughout the day. Many clients have been adding additional non-work spaces for collaboration, such as coffee bars or micro-kitchens. These spaces offer opportunities for interaction between teams and the casual exchange of ideas. 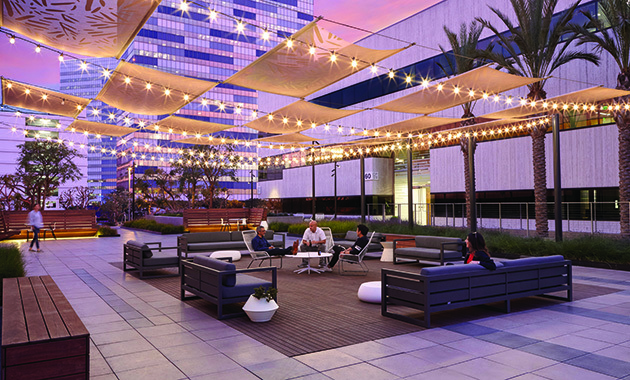 Given the studies that show incorporating plant life into your workspace can help ease employee stress, we expect more companies will start introducing outdoor elements to their designs. 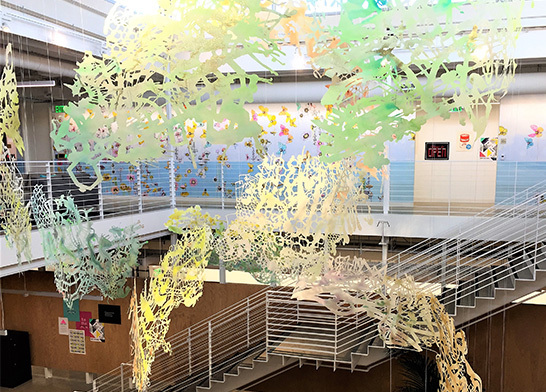 Biophilic design, which involves using natural design elements like sources of natural light and fresh air, is especially appealing for departmental managers seeking to improve team productivity and reduce mental strain. 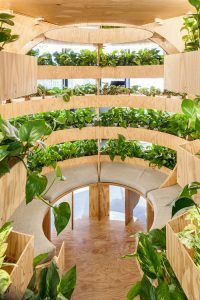 This could come in the form of living walls and more houseplants in communal spaces. 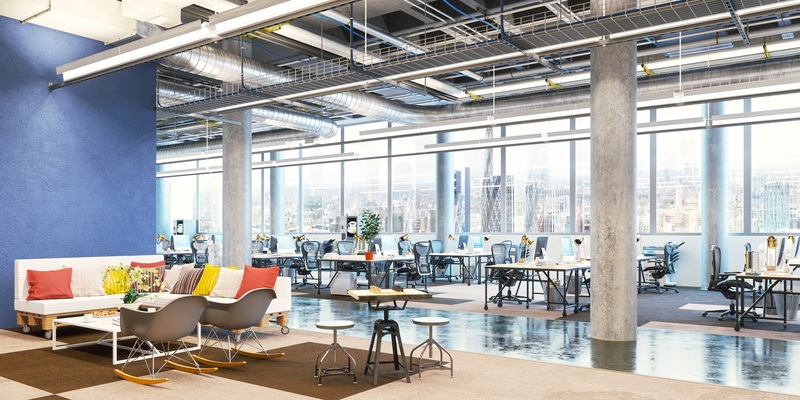 It could also be created by placing open office desks near windows for employees to enjoy throughout the day and shared communal spaces on the interior of the floor plate. Research suggests that more comfortable office spaces can improve productivity. 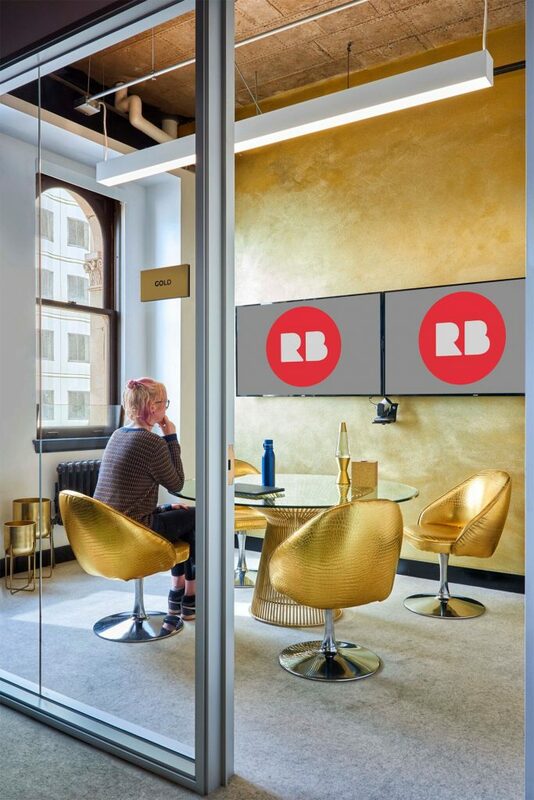 Some companies, such as our client Redbubble, created a soothing home environment by fashioning a meeting space after a cozy library. Most people think co-working spaces are only for freelancers and small businesses. However, many larger companies are busting that myth and leasing co-working spaces to provide flexibility in their real estate strategy. 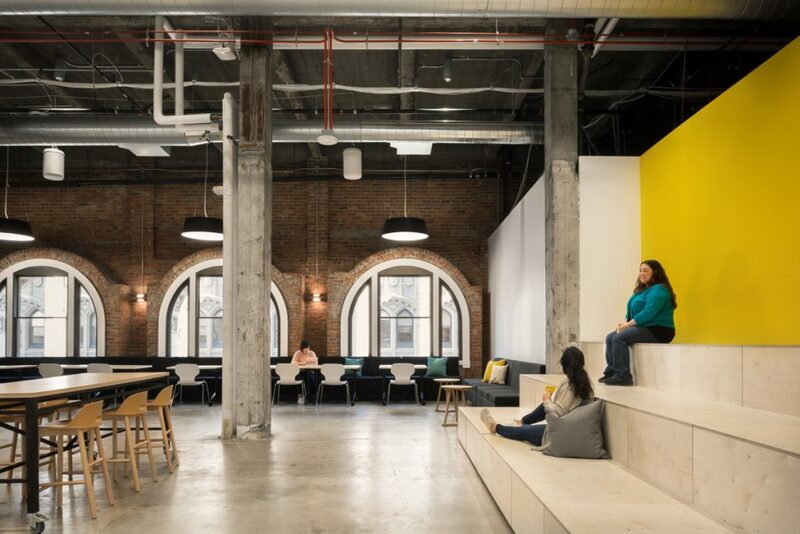 In mid-2018, Facebook announced that it would be leasing almost all of WeWork’s latest co-working space in Mountain View, California. We suspect more companies will be following Facebook’s lead in 2019. 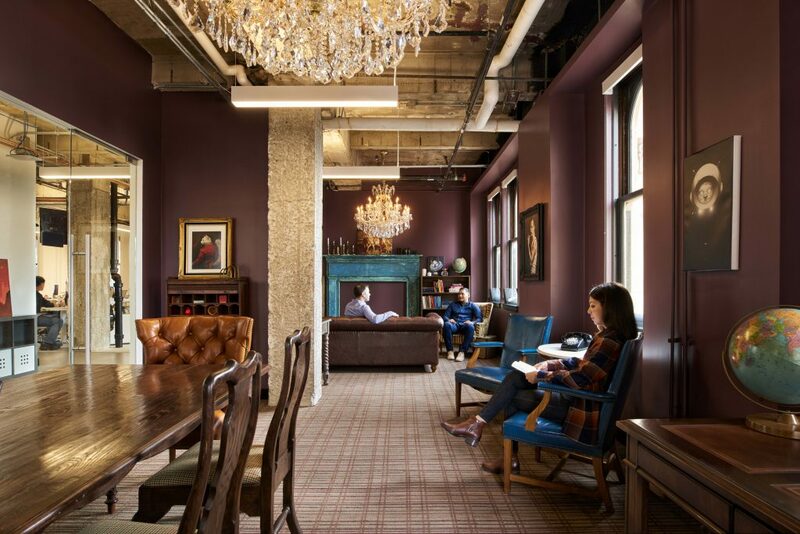 Partnerships with co-working spaces allow larger companies to get available office space faster for projects requiring a quick turnaround, without requiring a large spend on buildout. Companies continue to look for ways to differentiate their facilities from others in order to attract top talent. One strategy that will continue to gain traction is be renovating old buildings, such as warehouses, into high-tech office space. 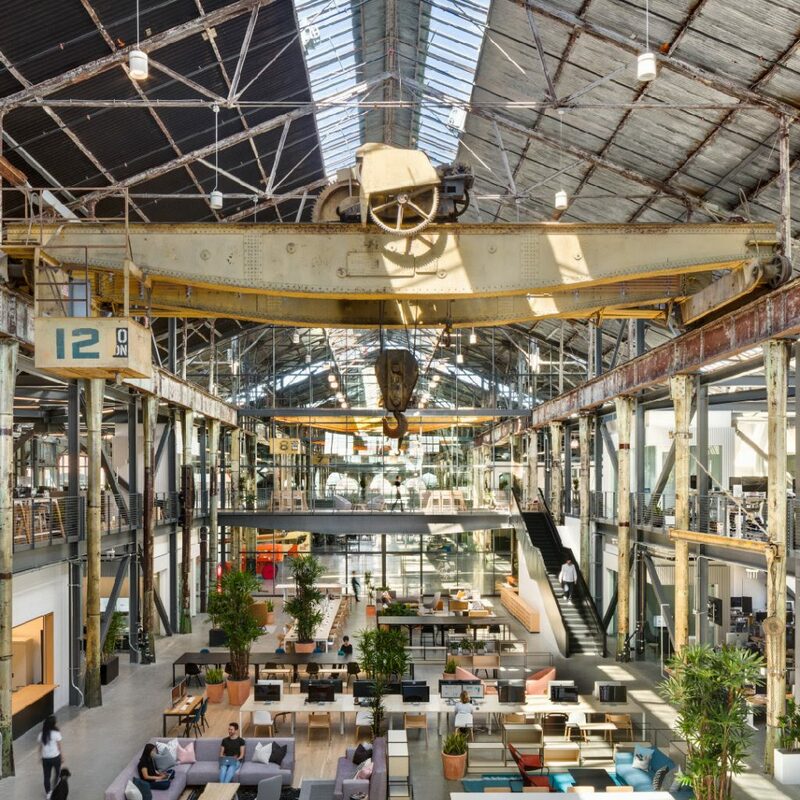 The exposed beams and high ceilings add character to an office and are defining elements for tech companies such as Gusto. 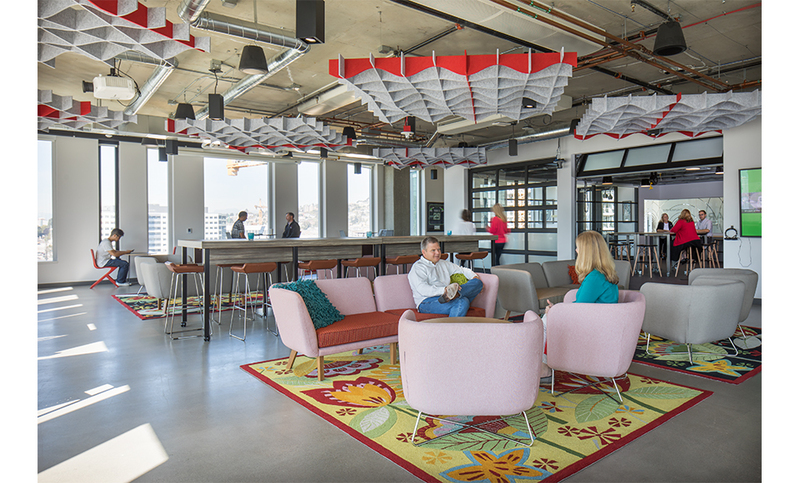 The HR software company recently renovated Pier 70 in San Francisco to create a fresh, unique space for employees to work and collaborate. What facilities or workplace trends do you think we’ll be seeing more of in 2019? We'd love to hear from you! Gusto’s new home at Pier 70 tells a story about history, community, and relationships. Photo credit to Gensler. 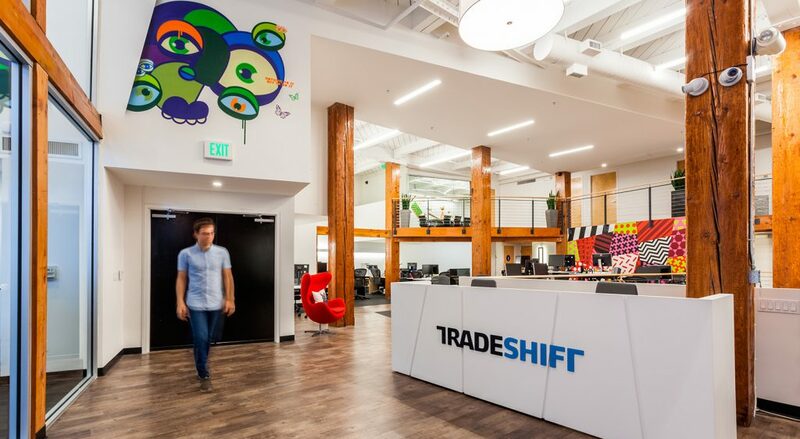 Our client, Tradeshift, takes company security seriously throughout their office and in the reception area with cameras. How confident are you that the security measures you have in place today will prevent your company from becoming the victim of a devastating theft? Nobody enjoys planning for the worst case scenario. Security should be a key consideration during the planning phase of any office design or relocation project. The good news is that deterring theft doesn’t have to be expensive or complicated. If your approach to workplace security so far has been remembering to lock the doors and saying a quick prayer before bed, it’s time to step up your game. Here’s four tips you can use to improve security at your business. Consider what you’re trying to capture before mounting cameras. Are you trying to catch footage of a potential suspect entering or exiting the building? Do you want to know where they go if they get inside? What about a shot of the type of vehicle they’re driving? Your local police department may be able to provide specific recommendations about the type of footage that is helpful for identifying criminals. Card readers or keypads are the two top options for most business owners today; with keys, you have the expense of changing the locks every time an employee leaves. Many of our clients opt for card readers so employees don’t have the burden of remembering a code (and potentially sharing that code with outsiders). Card readers also produce a record of who entered and when so you can review in the event of an incident. We recommend placing card readers on exterior doors, IDF rooms, and possibly storerooms, depending on what you have inside. Depending on the type of building, consider using a latch plate to prevent would-be thieves from using a crowbar to gain entry. Since most offices are uninhabited at night, alarms are extremely useful to tip off potential thieves that their presence on your property has not gone unnoticed. 60% of burglars said they look for an alarm system before robbing a home— and if they find one, they move along to another target. You can install alarms that are monitored by a security service, or simply use the alarm itself as a deterrent. When we think about theft, many of us imagine criminals dressed in black sneaking into your facility in the dead of night. But today, many thefts occur during broad daylight, perhaps when your receptionist has stepped away for lunch or many of your employees are in a meeting or attending an off-site. If you don’t receive a lot of visitors, consider keeping your front door locked at all times and buzzing guests in as needed. If you do frequently have guests, taking turns at the reception desk is a good way to make sure there are always eyes on the door. Finally, make sure all of your employees are aware of the possibility of theft. Help them feel comfortable coming to your security/facility team or management with any concerns, or if they see someone who doesn’t belong. For general information by the USDA, Office of Procurement and Property Management for use in addressing security in the workplace issues, click here. 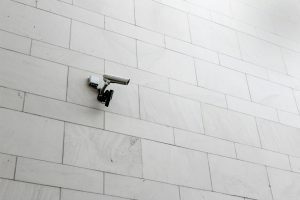 Looking to make office security a priority in 2019? Contact us for a consultation. As you probably already know from part one of our series on designing for employee health, office design can have a significant impact on your employee’s wellbeing and productivity. Whether you’re moving into a new office or constructing your first corporate campus, your entire team should be thinking about how your employees will inhabit every space— and, in turn, the impact that these spaces will have on their mental and physical health. In collaboration with our partner Two Furnish, we came up with four approaches we’ve deployed to help our clients design locations that help employees stay fit while they’re at work. For example, one of our tech clients in Los Angeles placed a staircase in the middle of the floorplan instead of on the perimeter. When staircases are accessible and centrally located, employees are more likely to take the stairs instead of an elevator. As you work with an architect to design the floor plan of your new office, pause to think about how employees will travel through the space. How can you organize services (such as bathrooms, kitchens, and elevators) in a way that will encourage employees to move? Walking meetings are all the rage today— they help employees gain more energy and reap all the benefits of increased physical activity, like lower healthcare costs and a reduced number of sick days. Creating outdoor spaces like gardens, a track, or hiking trails will give your employees a big push to take their meetings outdoors when the weather permits. Offering umbrellas that anyone can take when they head out for a walk is another way to encourage them to think of the outdoors as another workspace. Microsoft’s campus in Seattle, which is pedestrian friendly includes walking paths just for recreation, does an excellent job of creating space for outdoor work and leisure. Nearby forest trails provide additional options for employees wanting to get away from their desks and enjoy some fresh air. 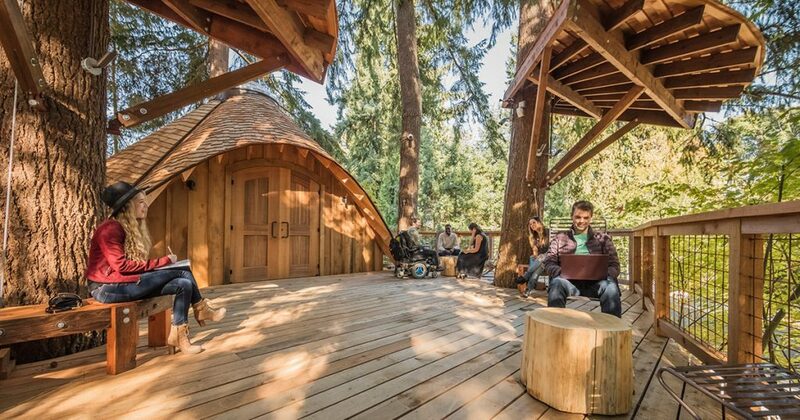 In 2017, the technology company created a treehouse outfitted with power outlets and wifi for use as a meeting space or outdoor workstation. 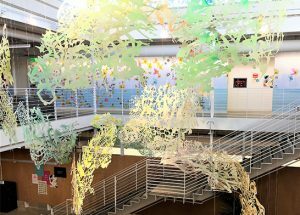 Their intention was to foster a greater connection between their employees and the outdoors, which has been shown to boost creativity and wellbeing. If building your own outdoor paradise isn’t in the budget, consider looking for an office adjacent to a public park, beach, or recreation site. If you’re seeking space in the financial district where outdoor space may be limited, consider a building with a public open space such as a rooftop garden. 70% of all full-time workers in the U.S. hate sitting, but they’re often stuck glued to their task chairs day in and day out. Long periods at a desk combined with poor posture can also lead to back pain, which can contribute to increased rates of absenteeism. Offer your staff a variety of ways they can work outside of the standard office chair. This could be sit-to-stand desks, modular furniture, foam mats to make standing more comfortable, configurable tables with casters, or yoga balls. By giving employees the gift of choice, they’ll be encouraged to move into whatever position is most comfortable for them throughout the day. Finally, give employees space they can use to move their body and relax their mind. The workout they get from a game of ping pong, a brief yoga session, or a workout in an on-site gym can provide quick stress relief. And don’t be afraid to think outside the box: not all fitness is physical. 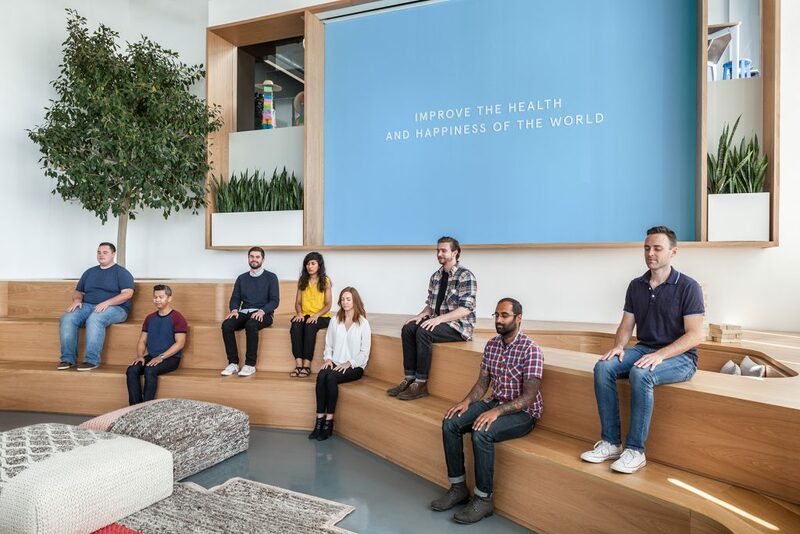 Two Furnish worked with Kelly Robinson who co-designed medication pods with Headspace, creating a place where employees could step away for a moment of calm as our main featured photo. The “Lookout” also serves as a communal space adjacent to a large café and auditorium integrating a multipurpose room for a few minutes of repose. These are just a few of the many ways you can use design to help your employees feel better both during their time at the office and when they get home at the end of the day. When you’re ready to think about how your office space contributes to employee health, we’re here to help. Reach out to us for a free consultation. 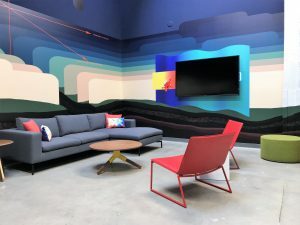 Uber Technologies’ new office in Mission Bay sought to foster connections between employees and the great outdoors. 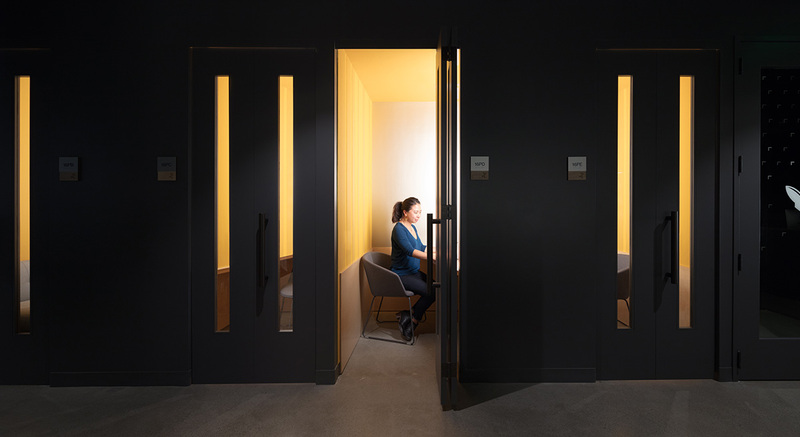 By placing all services such as elevators and restrooms at the building’s core, every employee can have a workstation within 20--30 feet of a window. Construction costs spiraling out of control? Here’s how to handle it. As project managers, it’s our job to make sure our client’s office build-out is completed on time and within budget. 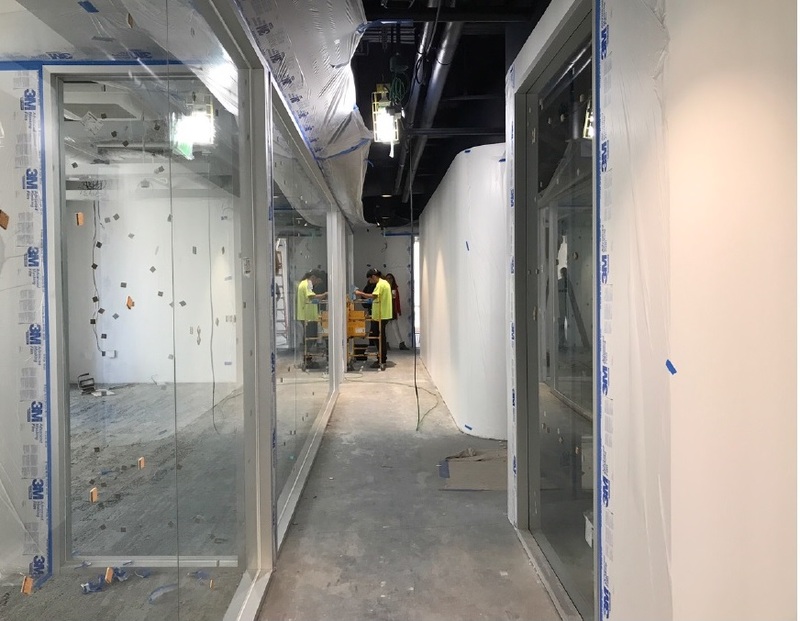 We frequently partner with startups and companies who are growing rapidly and have a strict budget with little room for the costly overruns that can become an insidious part of the construction process. As a result, we’ve fine-tuned our ability to get our clients the best value for their money. 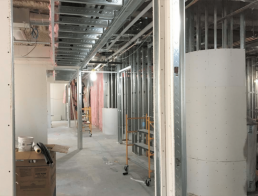 Here are three strategies Construction Managers, Facility Managers and Operations Teams can employ to keep costs low while ensuring that your new space meets your needs. By hiring a general contractor early in the project, you can price the plans at various stages during the design process. Then, your team can conduct value engineering exercises as they design and prevent costly surprises once the construction documents are complete. A general contractor can also identify where the costs are coming in high and make suggestions for places you can cut back. Ideally, your project management firm will work closely with the design team and general contractor at this stage to ensure sure they’re reducing costs without sacrificing quality. Skyline Construction created a tool called the Bay Area Cost Comparison to help guide you towards a less expensive project. This white paper will give you an idea of what an average project might cost in your area, what factors drive escalation, and what cost saving measures to look for. We brought all these strategies together during our recent work for RocketSpace, a San Francisco based co-working space. Our team partnered with Skyline Construction, while we were still finalizing the fit plan so they were contracted and ready to price at the end of the schematic design phase. We conducted a second round of pricing after the design development phase and then, of course, at the end of construction documentation. Our partnership with Skyline Construction helped us discover several ways to save on construction project costs. Project savings included; re-working the mechanical design, selecting less expensive light fixtures, re-thinking the door selection to each office space and finding a less expensive finish for the millwork. It would have been disastrous if we had discovered these expenses after our construction documents were complete, since it would have delayed the project and led to change orders from our design team. As it was, our team was able to make these decisions while the plans were coming together, which resulted in construction costs meeting our budget and staying on track with our timeline. We’re not afraid of a small construction project budget. Find out how we can help with your next project or discuss some costs savings alternatives. Contact us now for your free project consultation. What do the offices of companies like Facebook, IBM, GE and Apple all have in common? 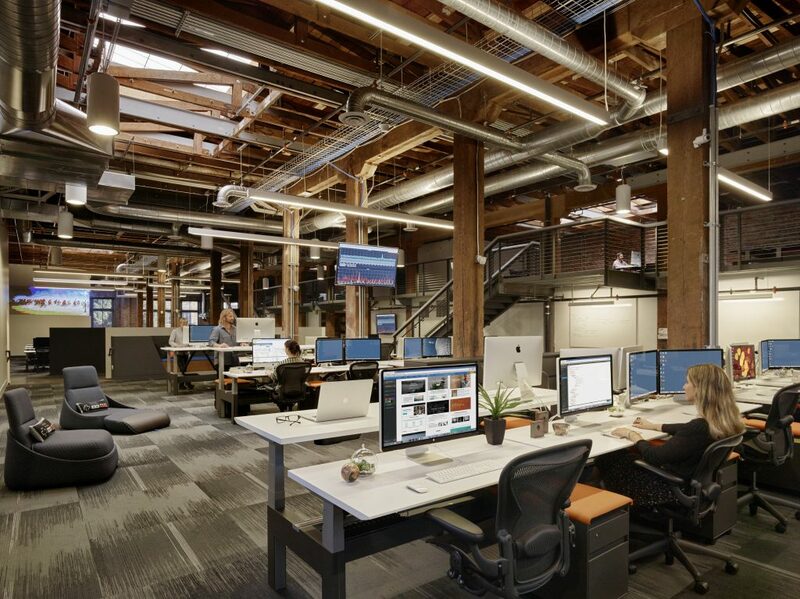 If you guessed that they all incorporate open office space into their design, you’d be correct. Open office layouts continue to gain popularity as many companies make the switch to encourage a more collaborative work environment. Unsurprisingly, most of our recent projects involve at least some open concept space, although they aren’t without controversy. Many employees have complained that open workspaces have a negative effect on their productivity, make it easier for germs to spread, and dampen creativity. I didn’t fully understand what it was like to work in an open office until I tried it for myself. Although it was difficult at first to maintain focus amid co-workers discussing their lunch plans or recent weekend trips, I eventually learned to drown out the noise and get my work done. This foray into open seating helped me develop a deeper sense of empathy for clients making the difficult decision to move their employees out of cubicles or separate offices into one open plan layout. Along the way, I developed this list of five key actions you need to take in order to keep your employees happy and productive during this type of transition. Provide phone rooms and meetings areas. For distraction-free work and the need for private conversations, consider setting up a few hotel offices. 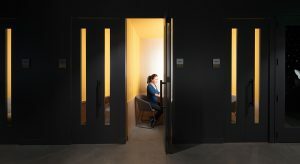 Employees can reserve these offices for a couple of hours at a time and use them for private calls, confidential discussions, and projects that call for deep focus. Give employees space for their personal items. Think of the desk as your employee’s home away from home. By giving them license to personalize their space, you empower them to feel like they truly own the space. If you’re considering a hotel-seating model, which involves unassigned desks, make sure your employees have lockers where they can store personal items. Consider acoustics. Don’t limit yourself by focusing only on how a space looks. Think about how sound travels through an area and how different personality types react to various sound environments. Offer spaces for fun. 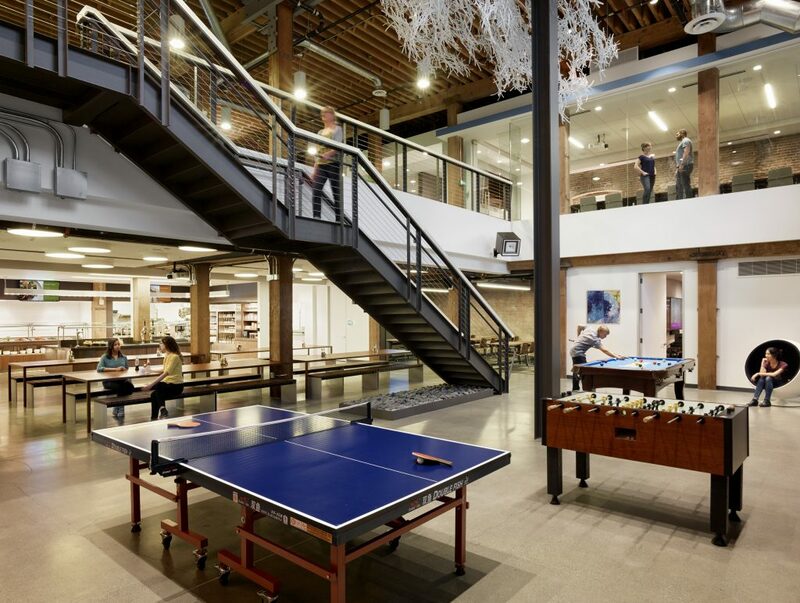 This includes incorporating areas where employees can take their work if they need to get away, including high-top tables or casual sitting areas. I’ve even seen clients provide hammocks, lego-building areas, or yoga space so employees can take a mini-retreat during the day. Sell the positive. Make sure you focus on the upsides of the new space instead of the potential downsides. For instance, sitting alongside your manager may make them easier to approach with new ideas. There’s also more energy in the workplace when people aren’t hidden away in enclosed offices or cubicles. Give them time to get used to it. No matter what your personality type, it still takes time to adjust to a new way of working. Try offering headphones to people who are having a difficult time tuning out the noise. After a while, you may notice they don’t need them. Change of any kind can be difficult for employees to handle. The most important key to a smooth transition is listening to your employee’s concerns — don’t downplay them, and don’t imply that things will be the same as they were before. Rather, empathize with their worries and then consult with your designer or facility manager and see if there are any practical steps you can take to address them. Is your company undergoing tenant improvements or moving? Can’t decide if an open office concept is suitable for your employees? Since most of us will spend an average of almost nine hours at work each and every day, working in a space that reflects our styles and preferences is critical for workplace happiness. For many people, moving into a new office offers an exciting opportunity to re-imagine a space where you spend a large chunk of your time. But for others, moving offices can feel like an extra stressor on top of existing responsibilities. Team leaders need to be prepared to manage employee expectations and guide them through the transition. Before you start planning your next move, study these approaches to helping your employees view the change in a positive light. Deliver Consistent Communication – It’s critical to start discussing the move with your employees early in the process. In particular, make sure you announce the new location, when the move will be happening, and how employees can prepare as soon as you can. It’s important to give them as much advance notice regarding these decisions as possible so they can get used to the idea. Make sure to highlight some of the upsides of the new space in your communications, such as easier commutes for employees or upgraded facilities. Get Employees Involved – Employees need to feel that their voice is being heard during the design process. Before you start, consider sending out a survey to understand your employees’ needs and ask department leads to confirm headcount numbers and growth plans. You should also consider inviting team leaders to be part of the design process during certain stages, including finalizing the fit plan and furniture selection. It’s important to convey deadlines to getting information to avoid having to make changes later which can be costly and add time to the project. Give Tours of the New Site – Seeing the space during construction can help foster excitement and ease potential negatives among employees who are reluctant to get on board. You’ll need to coordinate with your general contractor, but many can accommodate hosting tours in the late afternoon when the workers have left for the day. You’ll want to keep the groups small to ensure safety on site, so send out a signup list where people can reserve their spot on a first come, first serve basis. 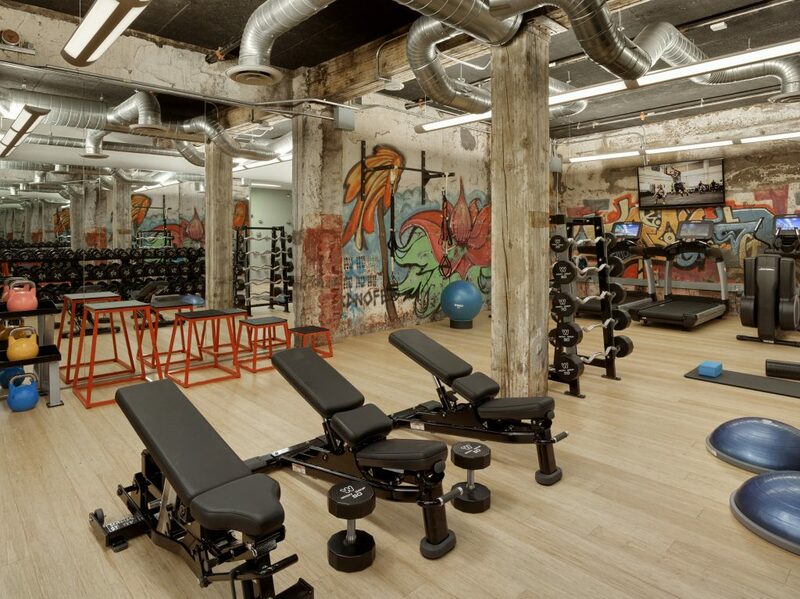 The Bridge Group LLC's office build-out in SOMA for San Francisco client. Be sure to warn people to wear pants and close-toed shoes and ask your contractor to have hard hats and safety vests available. Hold a Move Discussion – It’s important to reserve some time during company all hands meetings to discuss the move. 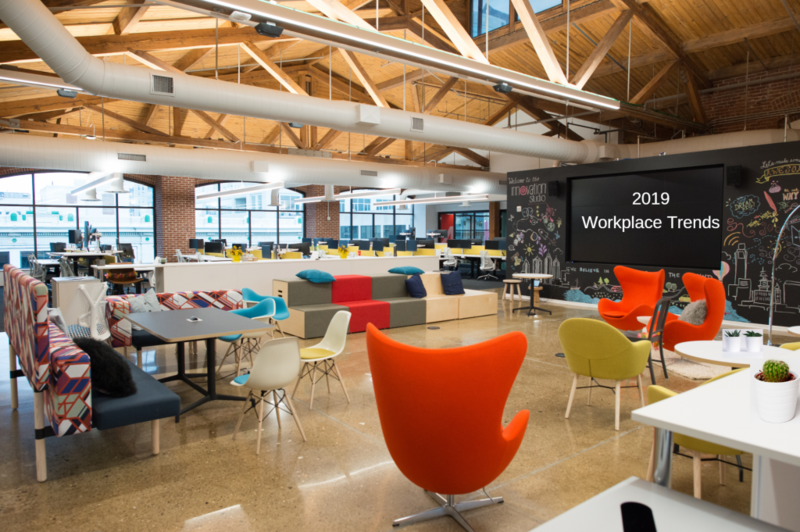 You may want to put together a slide deck showing the look and feel of the new space, maps highlighting neighborhood amenities, and photographs of any upgrades that the employees might enjoy, like new sit-stand desks or improved AV/VC in meeting rooms. Make it Fun – Preparing for a move can be a lot of work, so you need to add an element of fun. For example, many of our clients typically hold a purge day to give everyone an opportunity to clean out their desks and storage areas. Sounds stressful, right? It doesn’t have to be. Bring in food, drink and create contests with prizes to make the process more enjoyable. Although most people think of moving as painful, if you get employees excited about the new location, it’s easier for them to see the payoff behind all the hard work associated with an office move. 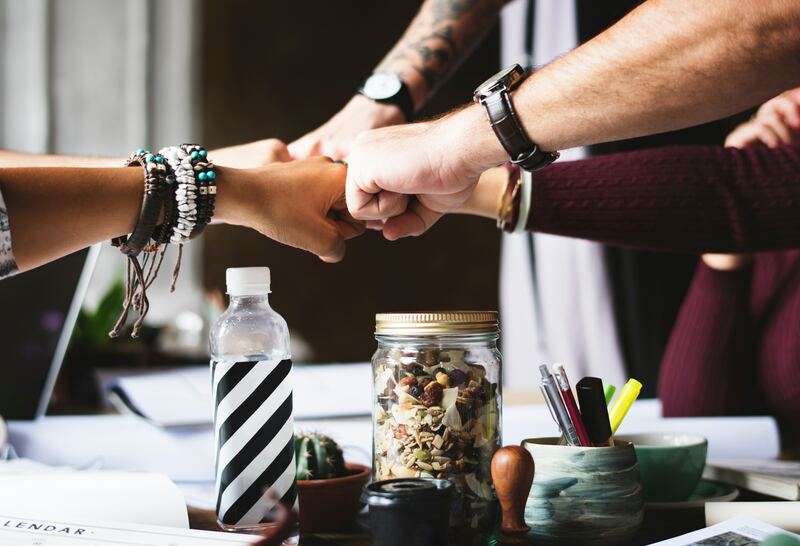 Engaging your employees in the company relocation process with the tips outlined is a valuable strategy which will have a positive impact on your bottom line. Has your organization experienced a recent move? We’d love to hear what other tips may have made your transition positive for everyone. Please comment below.